Personalised printed deck chairs add a real feel good personal touch to your event and printed branded deck chairs are an eye catching promotional item for your events. Decks chairs are ideal for custom printing with their strong wooden frame which holds the traditional canvas fabric in place, ready to be printed with your message or branding. 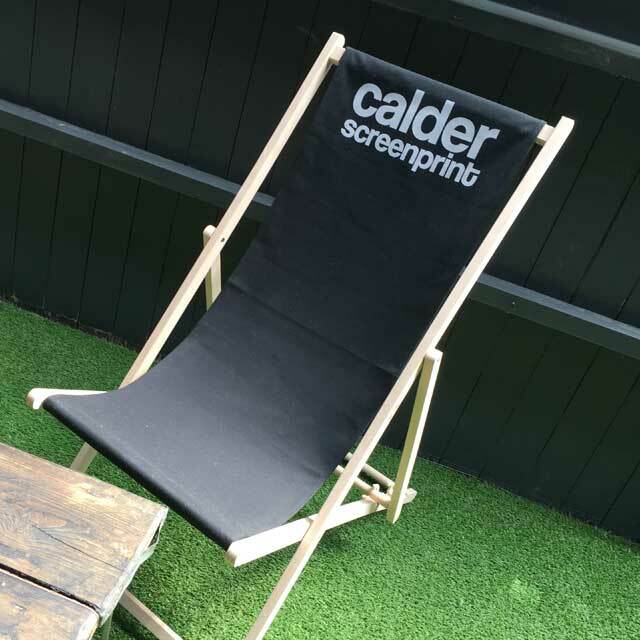 Calder Screenprint will custom print your deck chairs in full vibrant colour with your personalised and custom branding or message. Tailor your order from just one custom deck chair to a larger order for your events. Too many forms to fill in on the Internet these days! We like to make it easy to order your printed deck chairs. Simply call us on 01422 377799 and we’ll talk to you in plain English on how to order your printed deck chairs.